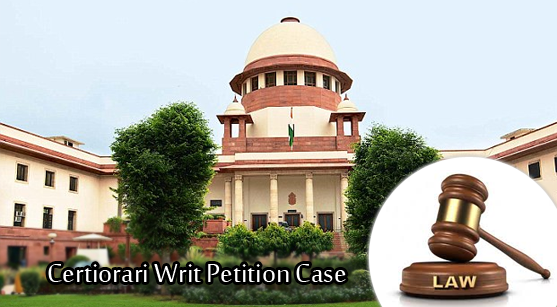 If you have fought the case in an Indian court and have not received a satisfactory judgment, you can approach a higher court like a high court for issuing a writ called as a certiorari writ. In Roman law, reviewing the case was as per certiorari. It was a highly technical term applying only in jurisprudential Latin. This is a writ issued to a quasi-judicial or a judicial authority to correct its order. You may have fought the case in a lower court but not received justice. The writ of certiorari is issued on specific grounds like lack of or abuse of jurisdiction, violation of natural justice, fraud or error of law on the face of record. For instance, the law based on which the order is issued by a lower court may be void. The decision itself may violate the fundamental right. The order may violate the law or jurisdiction of the court. For example, your case might not fall under the jurisdiction of a lower court. So, the high court transfers the case from the lower courts to the high court. 2) It acts without jurisdiction. Certiorari may also be issued if a lower court or tribunal has violated flagrantly the principles of natural justice. For fighting such cases, you need the help of a well experienced advocate in the High Court. He will help you take your case from the lower court to a higher court if you have not received justice. The writ enables a high court to review the material from the decision of a lower court with the option of reversing the decision. This writ can also be utilized in the workplace to examine whether a punishment meted out by superior to a junior is appropriate. There should be an officer, tribunal or court to assess the definition of fundamental rights for judicial action. Such an officer, tribunal or court must have passed an order without jurisdiction or in excess of jurisdiction. Such an order may be violating the principle of natural justice or may have an error in judgment. The writ is passed by the high court for quashing the order, which has been passed already by the lower court. It aims at enforcement of Fundamental Rights (FR) of citizens. The constitution has guaranteed Fundamental Rights as per part 3 of the constitution. These rights would have been meaningless without making provisions for its enforcement. The framers of the constitution provided a provision in Article 32 and the Supreme Court protects and grants the FR. The scope of jurisdiction is very wide. One must hire the service of an expert advocate, who has plenty of experience in handling cases of this kind. These cases are fundamental to the basic structure of the constitution and an important element of the rights of citizens.